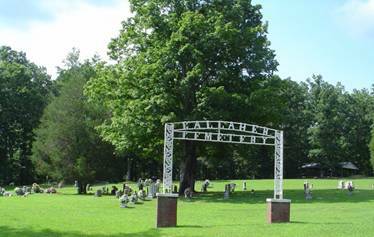 The Gallaher Cemetery is located east of the Natchez Trace Parkway northeast of Collinwood, Tennessee. To reach the cemetery turn east off the parkway just south of the Lower Glenrock rest area. Turn onto Glen Rock Rd. aka (Factory Creek Rd.) (Co. Rd. 1767 and travel 1 mile. The cemetery is on the left of the road. There are about one half dozen unknown graves here. One grave has a stone with what appears to have information etched into the stone, however it is not legible. Cole, Marwille E.; b. 21 Mar 1826, d. 17 Mar 1880, wife of J.W. Dial, Catharine M.; b. 22 Nov 1843, d. 03 Oct 1872, wife of Robert N.
Dial, Robert McDonald; b. 26 Apr 1881, d. 24 Mar 1889, son of J.W. & R.L. Dial, Robert N.; b. 18 Jan 1843, d. 05 Oct 1876, son of J. & S.
Duren, Evelyn M.; b. 01 Dec 1907, d. 20 Jan 1908, daughter of O.L. & A.B. Duren, Oscar L.; b. 15 Mar 1881, d. 30 Nov 1910, husband of Alva B.
Gallaher, David S.; b. 21 Apr 1859, d. 24 Apr 1864, son of J.G. & R.A.
Gallaher, infant; b. 08 Sep 1889, d. 08 Sep 1889, infant of J.L. & S.J. Gallaher, infant; b. 09 Feb 1892, d. 06 Mar 1892, son of W.M. & O.J. Gallaher, infant; b. 10 Jan 1873, d. 11 Jan 1873, son of J.G. & R.A.
Gallaher, Joannah; b. 06 Dec 1844, d. 28 Dec 1853, daughter of John & Ibby G.
Gallaher, John G.; b. 15 Feb 1871, d. 18 Apr 1880, son of W.Mc. & E.
Gallaher, Joseph N.; b. 17 Oct 1881, d. 01 Jun 1900, son of J.L. & S.J. Gallaher, Martha Chappel; b. 26 Nov 1897, d. 22 Apr 1901, daughter of W.M. & O.J. Gallaher, Sarah J.; b. 03 Aug 1856, d. 13 Jul 1935, wife of John L.
Gallaher, William T.; b. 26 Nov 1853, d. 02 Jun 1857, son of J.G. & R.A.
Haddock, Bertha E. (Stockard); b. 29 Apr 1933, d. 24 Jan 2015, wife of Ralph D.
Huckaba, Rhoda (Young); b. 22 Apr 1815, d. 27 Mar 1884, wife of George E.
Kelly, Elizabeth Imogene (Perry); b. 14 Aug 1929, d. 03 Jan 2016, wife of C.F. Lay, Annie E.; b. 09 Jan 1869, d. 30 Oct 1947, 2nd wife of William B. Lay, Martha Leona; b. 15 Nov 1848, d. 26 Nov 1889, 1st wife of William B. Lay, William A.; b. 29 Apr 1906, d. 21 Sep 1908, son of R.J. & S.F. Moore, William Leonard; b. 09 Jun 1883, d. 28 Apr 1900, son of C.F. & I.J. Walker, L.G. ; b. 20 Feb 1930, d. 24 Mar 2009, husband of Naomi R.